Cleaning granite counters? Freshening up shower stalls? Got carpet, pet or grout stains? Everyday... Everywhere... No Streaky Film! This POWERFUL cleaner is for you! It's strong enough for your most demanding tasks yet safe enough for your most delicate stone. It's great for Granite, Marble, Onyx, Travertine, Limestone, Carpet, Grout, Appliances plus MORE! Easy Oxy is great for spot cleaning granite counters, marble vanities, shower stalls, walls & toilets. 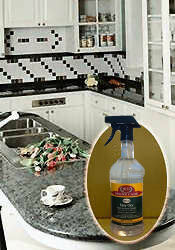 It's a heavy duty multi surface AND multi task cleaner that cleans quickly and easily leaving NO streaky film behind! mild enough for the MOST discriminating nose. Did I say EASY? Just spray & wipe. It's not only versatile but effective and easy to use. It's safe to use on ALL Natural Stones and surfaces. Even your most delicate! Stains? Allow the product to sit on the stained surface a little longer. Dab with an absorbent cloth. The multi tasking cleaner is the very best product line available to the end user of Stone for cleaning stone counter tops, vanities, shower walls, stalls AND all other natural stone. Gentle enough for your MOST delicate natural stone yet strong enough for your most demanding tasks. We used the easy oxy tonight. It was excellent! We tried many products on our range top which has this black enamel finish. Most products leave a streaky film... yours really worked great... no film at all. I think you need to advertise that aspect. I would recommend it for that alone.